Whole wheat bread and MIRACLE WHIP Light Dressing help make these tasty Salmon Roll-Ups a HEALTHY LIVING triumph. Trim and discard crusts from bread. Flatten bread with rolling pin to 1/4-inch thickness. Mix salmon, dressing, 1 Tbsp. dill and lemon juice until blended. 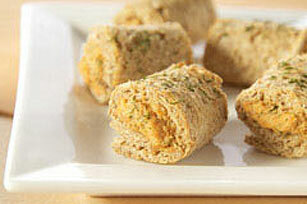 Spread 1 heaping tablespoonful salmon mixture onto half of each bread slice; roll up. Cut crosswise in half; place, cut sides down, on baking sheet. Brush with margarine; sprinkle with remaining dill. Bake 15 min. or until lightly browned. Serve warm. Substitute 1 Tbsp. dill weed for the chopped fresh dill.